Fine Arts Center of Greenville County - Productions Unlimited, Inc. | Productions Unlimited, Inc. Established in 1974, the Fine Arts Center of Greenville County is a distinctive school that offers artistically-inclined high school students advanced, concentrated training in Theatre, Dance, Visual Arts, Music, Creative Writing, Architecture, and Digital Filmmaking. Our task was to help the folks at the Fine Arts Center create several multi-purpose spaces suited to accommodate a number of the school’s disciplines. After extensive collaboration with the faculty and administration, we crafted plans for a recital hall, a black box theatre, a dance studio, a television & film studio, and a recording studio. 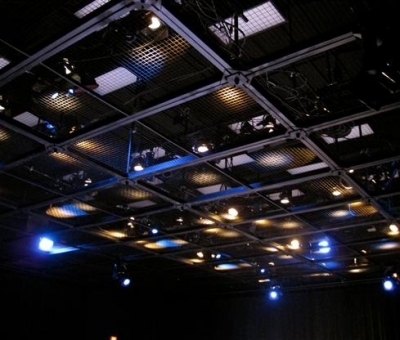 For the black box theatre, the dance studio, and the recital hall, we designed lighting and audio systems. We designed a highly refined lighting system for the television & film studio, and a comprehensive audio system for the recording studio. 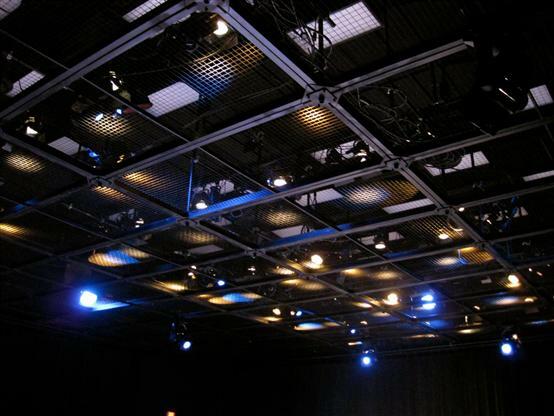 Several aspects of the lighting system in the 4400-square-foot black box are noteworthy. To begin with, an ETC Congo jr™ serves as the control for their package of ETC Source Four fixtures and eight ETC Revolution intelligent lights. Unlike the Ion and other consoles we typically install in high school, the Congo jr™ is a smaller version of ETC’s premier live event lighting console. This difference affords students the opportunity to practice lighting for more spontaneous scenarios in addition to learning the cue lighting typical of theatrical productions. 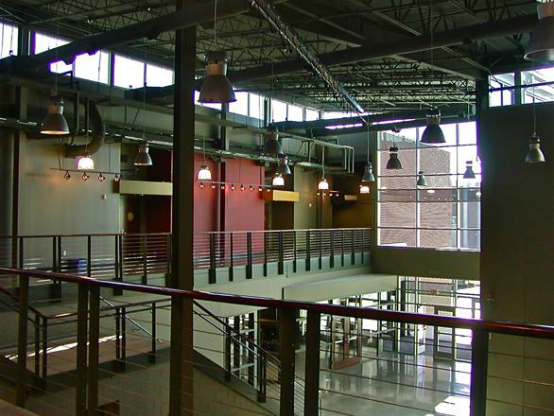 Also distinctive about the black box is a modular wire tension grid that hangs above the entire space, creating safe and easy access for students to adjust lighting fixtures. Because the black box is essentially a blank slate, we needed to design an audio system that offers a wide range for creative potential. To do this, we began by providing a core of Worx Audio speakers and subwoofers. Next, we provided a digital signal processor, by BSS Audio, used to tailor the system to the acoustics of the black box. A Yamaha 01V96 digital mixing console serves as the control interface for this space and completes the system. 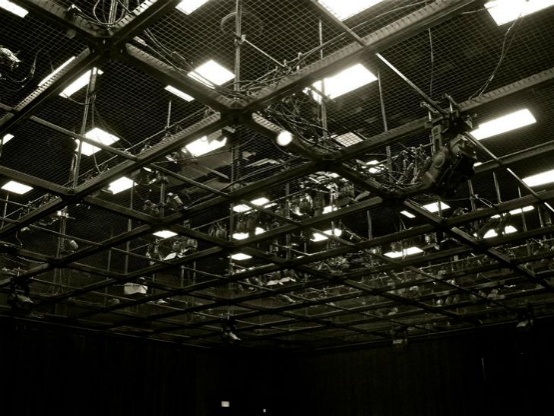 The lighting system in the dance studio is straightforward and user-friendly. Conventional fixtures and an ETC SmartFade console provide basic lighting for the studio’s everyday use as a practice facility. Built into the system is also an infrastructure for lighting an intimate recital, prefect for casually previewing student performances. Similarly ergonomic, we designed the dance studio’s audio system for maximum daily functionality and long-term durability. Once again, Worx Audio speakers and subwoofers form the heart of the system, complemented by Crown amplifiers. The system is controlled from a Soundcraft Spirit EPM8 mixing console and digital processing from Xilica creates an easily managed, well-balanced foundation for the studio’s sound system. The recital hall’s lighting system is extremely versatile. ETC Legacy Express 24/48 console works in conjunction with ETC fixtures and dimming to create lighting appropriate for everything from voice and dance recitals to jazz concerts to school meetings. The audio system in the recital hall also provides flexibility for the space’s multiple uses. A combination of processing from BSS Audio, Digimax, and Xilica delivers superior sound superior sound through a network of speakers and subwoofers from Worx Audio and amplifiers from Crown. A Yamaha 01V96 digital mixing console completes the audio system in the recital hall. 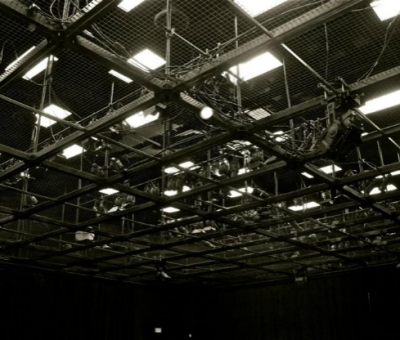 The television & film studio called for a different design approach than our typical lighting projects. We outfitted the space with Mole Richardson studio fixtures equipped with Matthews accessories including scrims, stands, and barn doors, for which we provided a combination of pipe grid and ground support. Simple control for this system comes from an ETC SmartFade console. Additionally, we provided paint for their chroma key. Experience with studio lighting and chroma key composition is atypical for the high school level. Fine Arts students benefit from the preparation this facility affords, emerging into higher education and the professional scene with distinctly advanced skills. 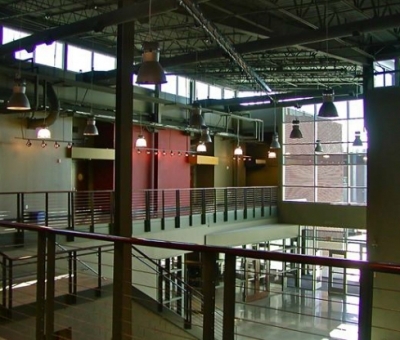 Though each space at the Fine Arts Center has special features and custom designs, what makes this facility truly unique is the extent to which the individual spaces are integrated and able to communicate with each other. A single dimmer room with three ETC Sensor 48-module dimmer racks hosts dimming for the entire building. Through advanced input patching, the individual spaces have access to their respective dimmers. The unity created by this setup is remarkably efficient. Furthermore, an architectural control system allows master control of all spaces from the main office, as well as conveniently local control of frequently-used lighting presets. Finally, we provided an ETC Emergency Lighting Transfer System for the entire building to ensure the safe transfer of emergency egress lighting to a back-up generator in the event of a power failure. Without a doubt, the Fine Arts Center of Greenville County is an exceptional educational facility, and the Productions Unlimited, Inc. team is delighted to have a continuing contribution to their mission.